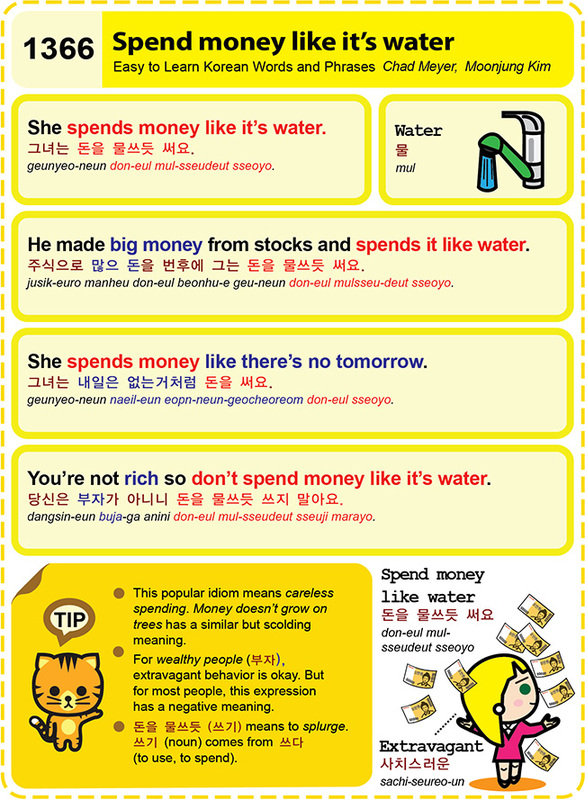 Easy to Learn Korean 1366 – Spend money like water. Posted in Series	| Tagged careless spending, He made big money from stock and spends it like water., Money doesn’t grow on trees, She spends money like there’s no tomorrow., spend money like it's water., spend money like water, to spend, to use, water, wealthy people, You’re not rich so don’t spend money like it’s water., 그녀는 내일은 없는거처럼 돈을 써요., 그녀는 돈을 물쓰듯 써요., 당신은 부자가 아니니 돈을 물쓰듯 쓰지 말아요., 돈을 물쓰듯 써요, 물, 부자, 쓰기, 주식으로 많으 돈을 번후에 그는 돈을 물쓰듯 써요. Easy to Learn Korean 1143 – Wealthy people.